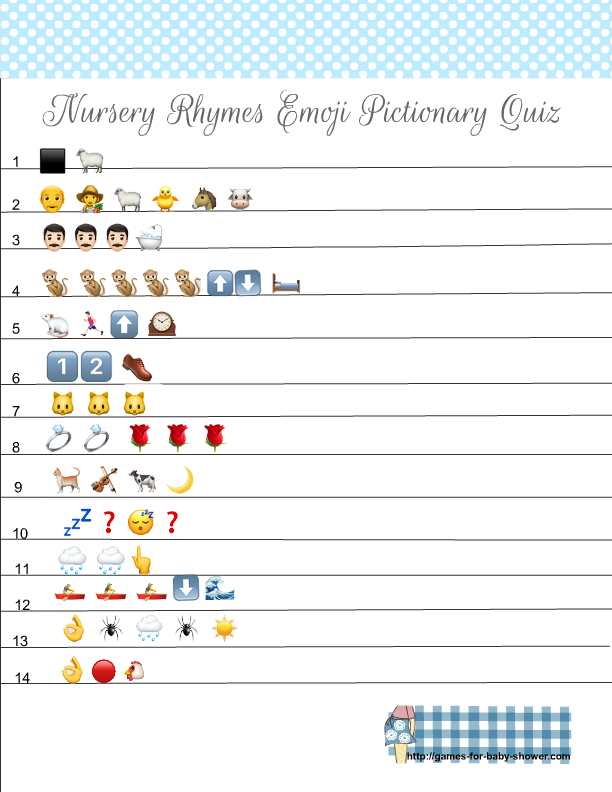 On this page I am sharing Free Printable Nursery Rhymes Emoji Pictionary Quiz in three different colors. This fun game is getting very popular these days and your guests will love this new, modern and unique game. You can easily print this game by using a color printer at your home or office. I have decorated the game headers with white polka dots and made these in pink, blue and yellow colors. 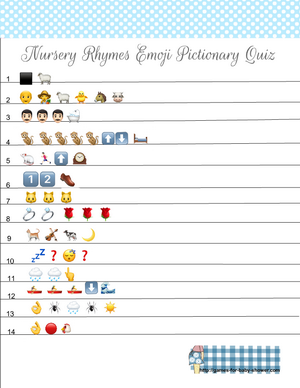 How to Play: Distribute a pen or pencil and a Emoji Pictionary game card among each Baby Shower party guest. Ask the guests to guess name of the nursery rhyme with the help of the clues that are given in form of Emoji. The guests will have to guess 14 different rhymes. I am sharing an answer key at the end of this page. The guest with most right answers will be the winner. This is a free printable image for this quiz game in a gender-neutral yelow color. This game card is decorated with a yellow header and white poka dots. 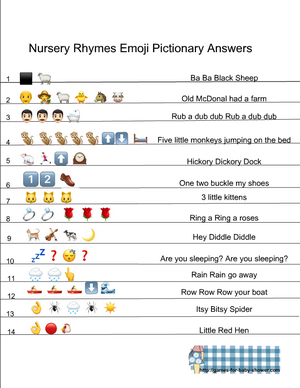 The guests will have to guss nursery rhymes as baba black sheep and five little monkeys. Just click on the thumbnail and a bigger printable image will open up. You can print this game either on card stock or any A4 white paper. This is another color for this free printable baby shower game. This game that is decorated with a pink header is perfect for a girl baby shower. Just use the same method that I have mentioned above to save this game. Here is another color that is perfect for a boy baby shower. 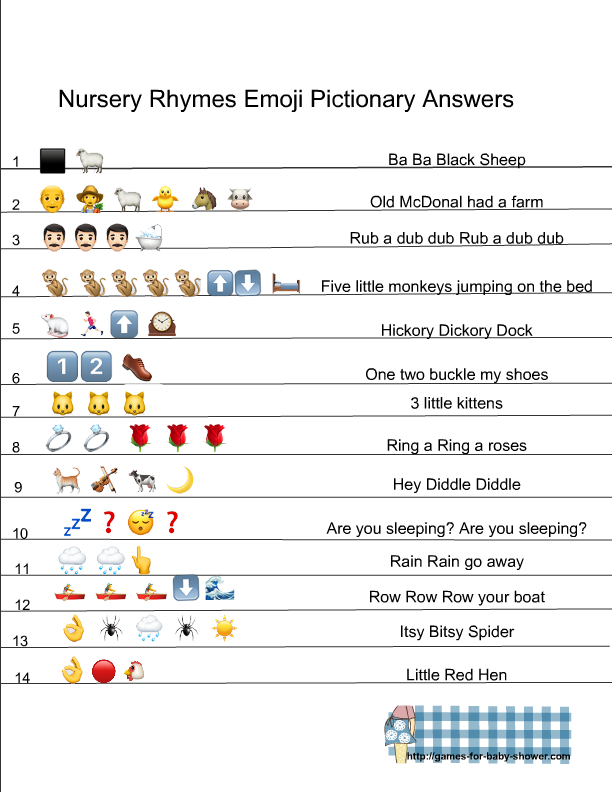 Here is a free printable answer key to this game. You can either print it or just keep it saved in your computer, tablet or phone to check the answers given by the gues. Make sure that your guests wont be able to look at it before completing their quiz.